Getting to Montclair from … Narod? 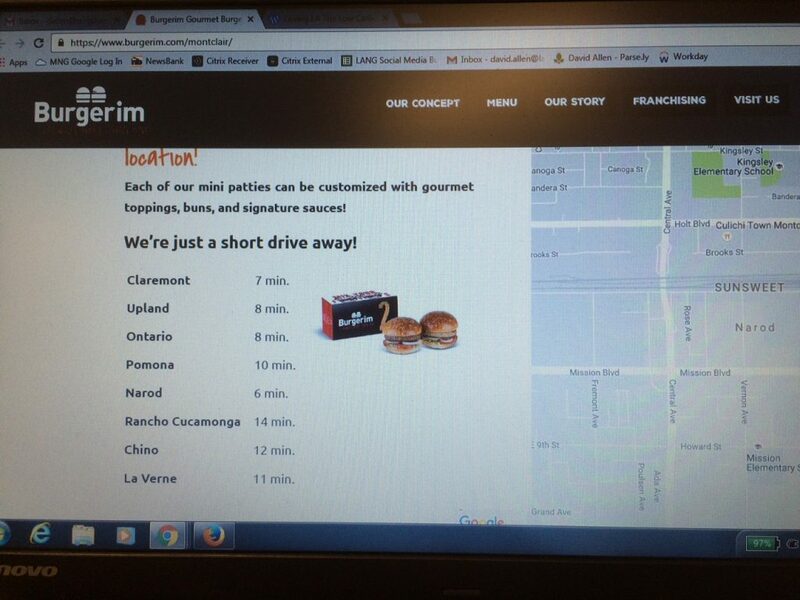 The website for Burgerim, a new hamburger emporium in Montclair, lists the driving distance from various local cities, including Narod. Narod? That’s a vanished community around Mission and Central, essentially the land between Montclair and Chino. Google lists Narod — I scrolled down the map to show it before doing the screen shot — as well as some other long-gone communities like Rochester and Grapeland. Click on the photo for a larger view. Anyway, I find it hilarious that Narod is listed on the Burgerim site, at least for now, alongside Ontario, Pomona and more. It’s six minutes away from the restaurant, by the way. Speaking of Burgerim, if you’re reading this Sept. 21, the place is giving away free food today in its grand opening, from 11 a.m. until they run out, at 9359 Central Ave. Since I have lived in the 909 since the time dinosaurs roamed going to Narod would be perfectly natural to me. This proves that Narod exists. It’s on maps as I recall. I smile as I drive by.